This week my partner and I had the chance to visit the Molalla river with Holly, a close friend of ours. She grew up close to the river and told us stories of her time here as a kid. The one I found most fascinating was about the major flooding in 1996 that pretty much changed the dynamics of the Molalla. 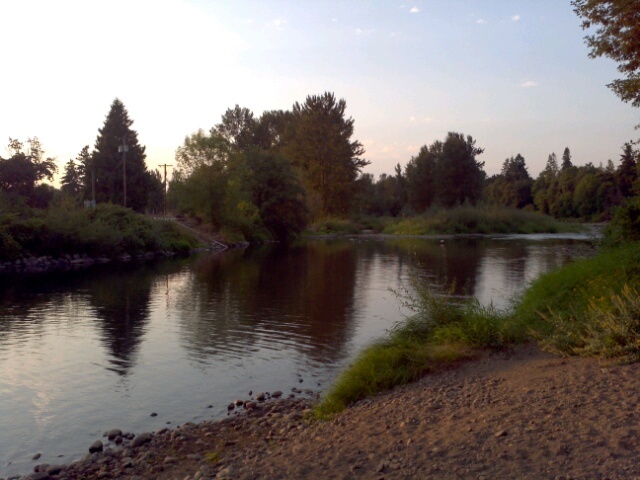 As a tributary of the Willamette River, the Molalla was adversely affected by the flood of 1996. This was that once a century flood that nearly inundated downtown Portland, Corvallis, Salem, Eugene and smaller towns along the Willamette. 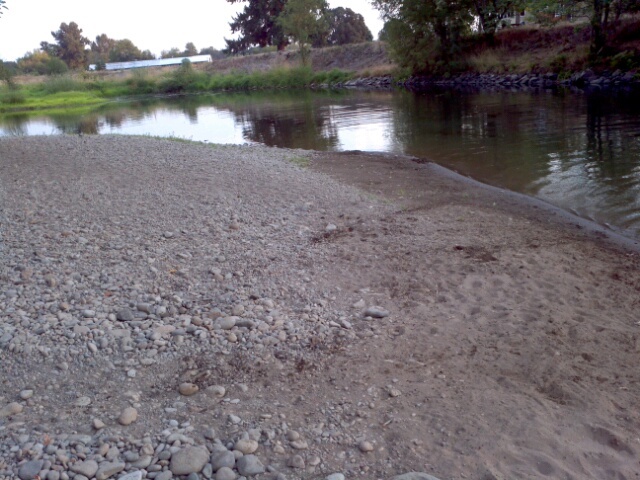 The Molalla River from the opposite direction. Notice the large cobbles the further up the beach from the river? This entry was posted in Uncategorized and tagged floods, oregon geology, postaweek, the Molalla River by glacialtill. Bookmark the permalink. I’ve got a video I’ll try to post on Vimeo next week that (if memory serves) discussed some of the impacts of the ’96 flood on the Mollala. A USDA hydrologist is the guest expert. It’ll be at http://vimeo.com/ccswcd once I find it and get it uploaded! Cool! Let me know when it’s up and i’ll link to it on this post. I’m no hydrologist either, but I would guess the cobbles->sand gradient is due to decreasing flow (thus decreasing competence) as the last high water receded. I doubt what you’re seeing there is a direct result of the enormous flood of 15 years ago. There are a couple of debris flows from that winter up Quartzville Creek I’ve been keeping an eye on, and last time I was up there, maybe 5 or 6 years ago, they were largely obscured by young alders. 15 years has been enough to hide most of the effects of that event. I think Lockwood has got it right. Either the cobbles represent a bigger event (but not necessarily 1996 in scale) and the sand represents a smaller event, or more likely that both can be deposited during a single event – cobbles during peak flow and sands as the water recedes and exposes the top of the bar. Lockwood’s point about the vegetation growth is also well taken – you’d expect something veggie to be colonizing deposits that weren’t inundated and rearranged on a fairly regular basis. Thanks for the feedback! I hadn’t thought about the vegetation growth over the past 15 years. Something I forgot to mention in the blog post was my friends’ dads comment about the sand. He said that’s been happening over the past few years and wasn’t present directly after the flood. In either case it’s from the decreasing flow of the Molalla, just as Lockwood suggested.